Is there something you have always wanted to do but have not done it because you think you can't? That perspective was holding back a young man who had so much going for him but who was stuck in "I can't" thinking. Our conversation triggered this issue's article, "If You Think You Can…"
Read "If You Think You Can…"
After spending nearly three years writing the Longevity Lifestyle Matters books and LLM program, Taylor is again doing more live presentations. Check out the Speaking Schedule on her website. Steve Horton just returned from Manila, The Philippines, where LLM Certified Facilitators led by Abraham Carpena PhD are presenting the first Longevity Lifestyle Matters program. Recently Taylor was in Camarillo where Dr. David Lowe and Flo Lowe are hosting their first Longevity Lifestyle Matters program. Later this year Taylor will be in Australia where David Stojcic, a Longevity Lifestyle Matters Certified Facilitator and PhD candidate—along with two new LLM CFs (Beverly Rey and Annette Hofman—is hosting the first Longevity Lifestyle Matters program in Australia. Are you on board with a Longevity Lifestyle? Healthier replacements. A good idea, especially knowing that taste buds replace themselves every two weeks or so. Taylor has added recipes containing healthier replacements for Treattata, Cherry Pie, Gravy, and other goodies. You may want to try them and then tweak some of your own favorites. Follow Taylor's weekday blog and stimulate your brain while learning more brain bits. 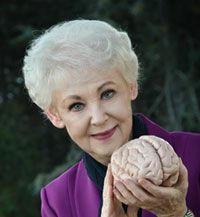 Access Taylor's blog from the website homepage (www.arlenetaylor.org), have it sent directly to your email, or access it from her Facebook page (Arlene R. Taylor PhD Brain Function Specialist). You are the only person who can embrace positive change for yourself; the only person who can create and live a Longevity Lifestyle—for you. No one else can do it for you, and it's amazing what you can do for yourself when you catch the vision and choose to grow. By the same token you cannot force others to change. You can role model and encourage them, but they are the only ones who can make positive changes for themselves. Once you really get this concept you may save a great deal of wasted energy.